We know many of you check Webmaster Tools daily (thank you! ), but not everybody has the time to monitor the health of their site 24/7. It can be time consuming to analyze all the data and identify the most important issues. 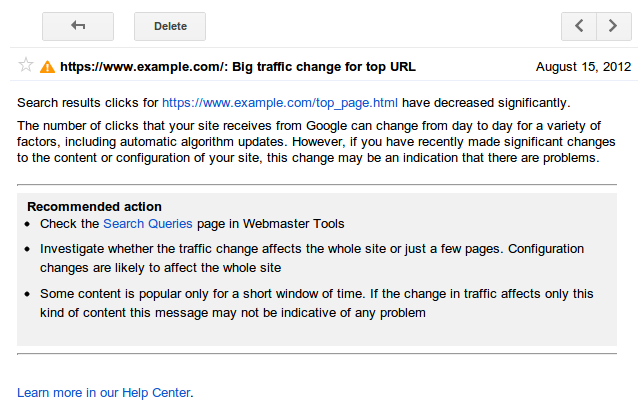 To make it a little bit easier we’ve been incorporating alerts into Webmaster Tools. We process the data for your site and try to detect the events that could be most interesting for you. Recently we rolled out alerts for Crawl Errors and today we’re introducing alerts for Search Queries data. 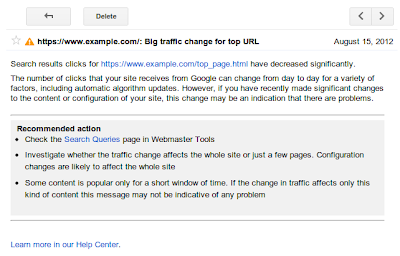 The Search Queries feature in Webmaster Tools shows, among other things, impressions and clicks for your top pages over time. For most sites, these numbers follow regular patterns, so when sudden spikes or drops occur, it can make sense to look into what caused them. Some changes are due to differing demand for your content, other times they may be due to technical issues that need to be resolved, such as broken redirects. For example, a steady stream of clicks which suddenly drops to zero is probably worth investigating. We’re still working on the sensitivity threshold of the messages and welcome your feedback in our help forums. We hope the new alerts will be useful. Don’t forget to sign up for email forwarding to receive them in your inbox.